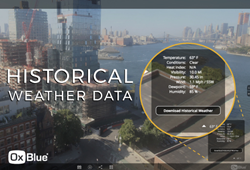 OxBlue has added historical weather data, a new feature, to its construction time-lapse camera system technology. Access to a wide variety of weather-related data allows project stakeholders and camera users to save time and improve efficiency through the automatic logging of construction jobsite weather conditions, typically a tedious, manual process for the crew. Jobsite superintendents and project managers can recover contract schedules that have been delayed or adversely affected by inclement weather by utilizing the feature’s downloadable spreadsheet to document and review the amount of rainfall, hail, and snowfall that has occurred. Project stakeholders can satisfy warranty requirements with easy retrieval of important atmospheric elements that may affect claims or liability, including temperature, humidity, and wind measurements. To use the new historical weather data feature, click the temperature button in the lower right corner of the OxBlue camera interface, and then click “Download Historical Weather.” A spreadsheet containing the project’s historical weather data in CSV format will be automatically downloaded to the computer. Try out the historical weather feature here. About OxBlue: OxBlue is a leading construction time-lapse camera service provider, serving clients globally. OxBlue’s high-resolution images, high-definition time-lapse videos, and intuitive technologies connect everyone to the jobsite, as well as make it easy to monitor, document, and market your project. OxBlue emphasizes client services and continuous improvement, as well as holds multiple awards for technology, innovation, and workplace culture.